A Portland State-led program to get pre-schoolers hooked on eating healthy, locally grown foods received a $98,608 grant this week from Walmart Foundation that will allow it to significantly expand its reach to low-income children and families. 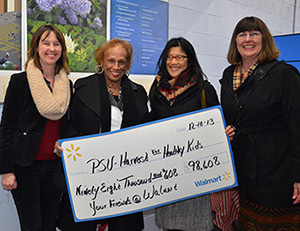 The Harvest for Healthy Kids research program pairs PSU with Mt. Hood Community College Head Start and Early Head Start programs in an effort funded by Kaiser Permanente Northwest’s Healthy Food Access Initiative, Meyer Memorial Trust and now the Walmart Foundation. Harvest for Healthy Kids will expand its healthy foods program to more than 2,000 low-income children and families in Multnomah County through the MHCC Head Start and Early Head Start preschool education programs. Against the backdrop of concerns about a lack of access to healthy foods and childhood obesity, the Harvest for Healthy Kids aims to intervene early, assisting low-income children and their families in establishing healthier eating habits. Effectively addressing childhood obesity requires a comprehensive strategy. Harvest for Healthy Kids can be one component of a broader approach to promote healthy eating habits. The program employs a three-pronged approach. Locally grown fruits and vegetables are served in the classroom, paired with education programs designed to teach students about the availability and health benefits of fresh, local foods. Take-home materials provide information designed to get families in on the action. Izumi partners with Dawn Barberis, the associate director of administrative services at MHCC Head Start who also runs the foodservice program. Barberis has worked with Head Start kitchen staff to integrate new fresh foods into the menu.